“Lightweight construction is boring!” Despite its immense explosiveness, this incredibly heretical statement was almost unheard of at a press conference on the fringes of an established automotive industry meeting in February in Germany. Actually, it’s surprising, since this statement came not just from anybody, but from a very well-known German automobile expert. Prof. Ferdinand Dudenhöffer knows what he is talking about. A few weeks earlier, his institute, the CAR (Center Automotive Research), had carried out a series of quite simple driving tests. Two electric cars, the BMW i3 compact car and the Tesla S sedan started the race. Both vehicles were tried several times on a 100 km test track. The energy consumption in the empty state, with only the driver on board, was analysed and with additional weight loads of 100, 200 and 300 kg each – these were gravel-filled bags. The result was surprising: the weight of the vehicle has hardly any effect on the range of electric cars. “The Tesla needed 17.77 kilowatt hours (kWh) of electricity on the 100-km test track with the driver at the wheel (...). However, if you add 100 kg of gravel, the consumption even drops to a minimum of 17.67 kWh. With 300 kg of river pebbles, the Model S requires 17.87 kWh. At this point you are in the range of measuring tolerances; the maximum increase in consumption is 0.6 %.”* The CAR researchers explain the test result with recuperation, the energy recovery during braking. The recovered energy during the test in the empty i3 was 3.62 kWh, with an additional load of 300 kg the value was significantly higher at 4.17 kWh. This recuperation effect compensates for at least part of the excess consumption with additional weight. According to CAR, Tesla’s value was even higher than that of the small BMW. Stop with the Carbon Credo?! Has this heralded the end of the fasting period for the automotive industry? For years, the lightweight dogma for e-mobility was preached quasi ex cathedra everywhere, and OEMs invested millions in carbon technologies. These dietary cravings sometimes sprouted bizarre blossoms when plastic manufacturers boasted that their polymer solutions for metal substitution had a major impact on the development of e‑mobility and they considered themselves not too good for claiming weight savings of components in the low double-digit gram range as milestones. There is no doubt that there is still a whole series of mobility concepts in which the subject of lightweight construction should be given top priority. But at least in electro mobility a paradigm shift is on the horizon. Lighter = faster? Wrong again! Are you at least faster if you are out and about as a light-weight? Not always! This is for example not the case if you are sitting in a glider and want to take part in a competition. Then you should fill the tanks in the ultra-light carbon fibre wings with water to optimize the gliding characteristics for higher speed. While I am writing this, a mechanical wall clock is ticking quietly in the background. The beautiful piece based on a kit is still in the adjustment phase. And what should I tell you? If you want to accelerate the course of the clock, because it is slow, you have to... yes, quite right! place additional weight on the middle of the pendulum. F. Dudenhöffer, J. Schnieders, M. Luhn: Elektroautos und die Neuinterpretation des Leichtbaus, Proceedings “Car Symposium 2018 – Transformation gestalten – Die Welt des neuen Autos”, Bochum, Germany, February 2018, p. 42ff. Dow Polyurethanes, a business unit of DowDuPont's Materials Science Division, has ­announced a cooperation agreement with Germany-based plant manufacturer H&S Anlagentechnik to develop the market for recycled polyols manufactured from end-of-life mattresses. Utech Europe 2018, the international trade fair and conference for the polyurethane industry, will take place from 29 – 31 May 2018 at the Maastricht Exhibition and Congress Centre (MECC) in Maastricht, the Netherlands. The event, which is organized every three years by Crain Communications Ltd, is one of the most important industry platforms for the European polyurethane industry. Utech 2015 attracted over 8,650 visitors during the three-day event. According to the organizer, this year’s event, consisting of a conference and an international exhibition, will be even bigger. A new MDI-terminated prepolymer based on a polyester has been developed. It cures with 1,4-butanediol to give polyurethane hot-cast elastomers. These are characterized by high tear resistance and low compression set at the same time. Under catalysis, the prepolymer can be economically processed in short to medium pot life. This enables the production of elastomer solutions with hardnesses of 83 – 87 Shore A, covering a wide range of requirements. The post-curing of the resulting components can be delayed without any loss of mechanical properties. Foam Expo 2018, that took place from 6 – 8 March 2018 in Novi, Michigan, USA, proved again that it is the must-attend event for everyone involved in the technical foam manufacturing supply chain. The show featured 291 exhibitors displaying cutting-edge technologies and concepts to nearly 4,900 visitors including representatives of industry titans such as Nike, Honeywell, Ford, Toyota, Amazon, BASF, Apple and Bose. 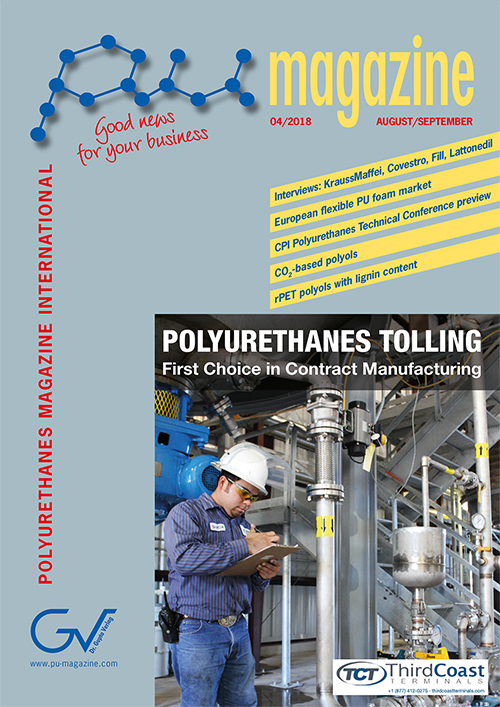 The last 2 – 2½ years has seen some major activity in M&A related to the polyurethanes industry. Changes are underway and M&A activity is one source of data to assess what strategic directions are being taken. This article looks at trends identified from over 120 publicly reported deals in the last 2 – 3 years. These are relentless consolidation, focused restructuring around core activities and access to growth markets. The arrival of Chinese companies on the global stage is also highlighted. JEC World 2018, the leading trade show that brings together all the composite industry stakeholders, from material producers to end-users, took place from 6 – 8 March 2018 in the Paris Nord Villepinte Exhibition Center in France. The show welcomed more than 1,300 exhibitors from every continent, counted 42,445 visitors from 115 countries and offered three days of vibrant networking and knowledge sharing opportunities. 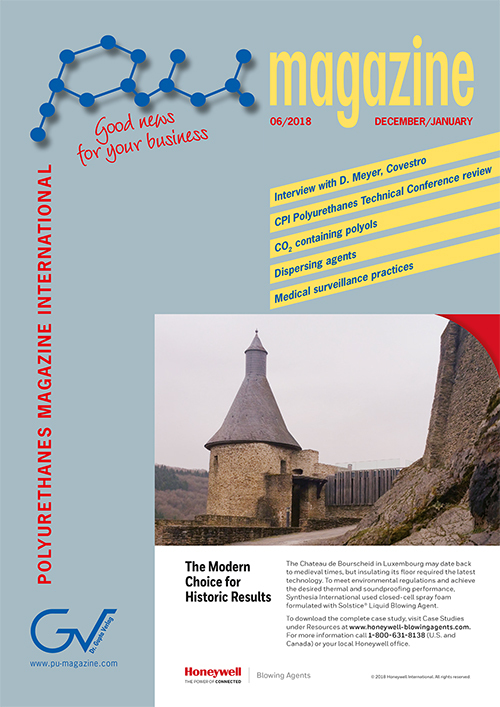 Building insulation is a neglected domain in most parts of India and the Indian Polyurethane Association (IPUA) took a positive step towards addressing the issues constructively by aligning with the rest of the insulation industry in 2013 to form the India Insulation Forum (IIF). The Conzzeta board of directors has elected Dr. Michael Riedel as the new CEO of FoamPartner. He started his new role on 1 January 2018, thereby also joining Conzzeta AG’s Executive Committee. This top-level change at FoamPartner was part of the company’s growth strategy. Michael Willome, Conzzeta Group CEO, says: “Michael Riedel offers the ideal combination of experience and skills required for the next stage in FoamPartner’s development. ln terms of business scale, we are venturing into new territory with the integration of Otto Bock Kunststoff. Together, we want to take advantage of the growth opportunities, also those that have emerged from the recent reorganization of the joint ventures in Asia and North America.” During a management meeting in Hamburg, we had the opportunity to talk to Dr. Riedel about his new role and the future orientation of the FoamPartner Group. Polyurethane formulations for footwear soling applications would typically use water as blowing agent to achieve the desired densities and specified hardness with excellent wear and physical properties. As the technology progresses towards much lighter materials with exceptional resilience and tear strength properties, and processing requirements become more demanding, we found of interest to explore the addition of relatively small quantities of physical blowing agents to the reactive components. Common physical blowing agents with high global warming potential are being phased out in the urethane industry and are not acceptable for elastomeric and microcellular foams. A new generation of non-flammable, low global warming potential blowing agents has been developed and its use is increasing in many applications. Huntsman has formulated systems based on products like HCFO-1233zd(E) for a variety of applications. We have developed novel system approaches based on new specialty prepolymers containing the alternative blowing agent, which have proven to offer machine-processing stability with a shelf life of at least 3 months. This paper will discuss the molding process and material property improvements critical to footwear and other elastomeric foams with a number of specific examples. In particular we will show examples of part quality, physical property improvements and other processing improvements such as better dimensional stability. The polyurethane industry continually strives to achieve improvements in productivity and quality through the development of cost-effective solutions. 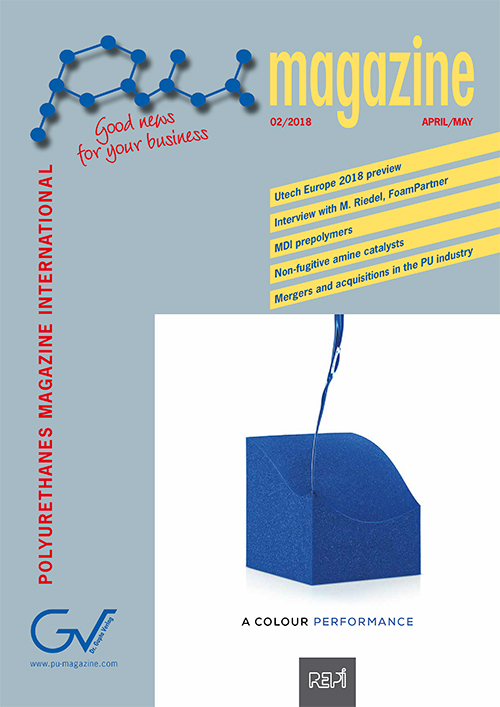 A continuing market trend requires polyurethane manufacturers to utilize additives that are not released into the environment under increasingly stringent conditions. The most significant challenge for additive suppliers is to provide no-odor and no-emission contribution additives without compromising the high standard of industrial foam physical properties. Although currently available amine catalysts are acceptable by today’s standards, the current competitive environment for better products is moving towards more environmentally friendly products with lower odor, lower emissions and ultimately no detectable exposure to chemicals for manufacturers and end users. 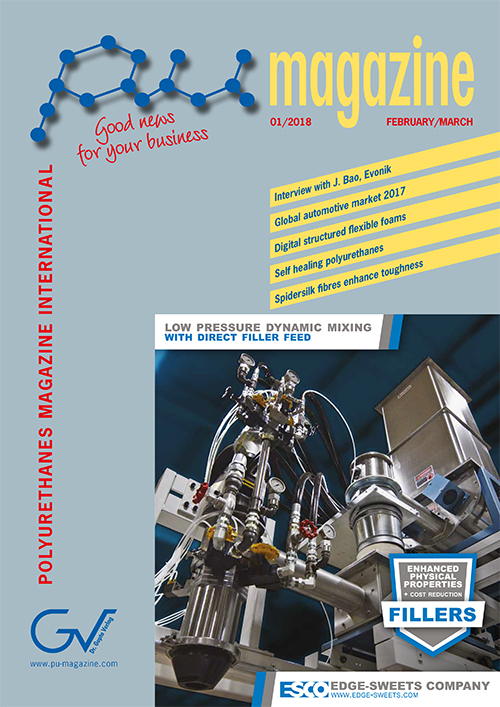 This ongoing market trend, intensified by the globalization of products, will certainly continue and impact how polyurethane formulators choose their additive packages to meet these requirements. 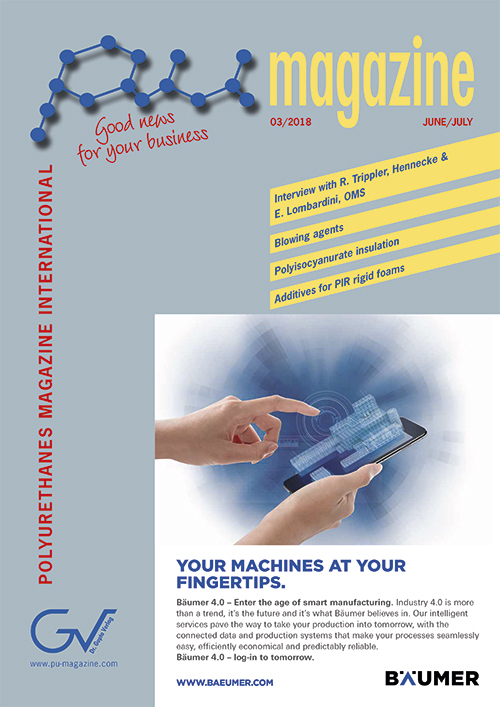 This paper reports on recent work to develop a novel, non-fugitive polyurethane amine catalyst, Dabco NE1550. The results of our developments show that this new additive provides the benefits of meeting the most stringent emission standards for the flexible molded polyurethane industry such as VDA 278 and OEM’s chamber tests, while maintaining high standards of overall foam performance. From furniture and bedding to automotive and sport applications, quality requirements are becoming more rigorous for foams used across the different industries. These have been constantly evolving toward environmentally-friendly, health-conscious, and sustainable product solutions. Subsequently, the attention to final article volatile component emission has greatly increased. As leaders in this push for environmental and health cognizance, automotive OEMs have been setting stringent material and final article emissions requirements, raising the standard to new levels to enhance vehicle interior air quality (VIAQ). Anti-scorch packages prevent degradation of polyols/PU foams, helping to avoid formation of volatile side products, which contribute to emissions, including aldehydes. Among anti-scorch systems, non-amine packages are well received not only because of their zero contribution to amine emissions but also due to their ability to confer to foams improved gas fading resistance and low light-induced discoloration, leading to high-quality foams. 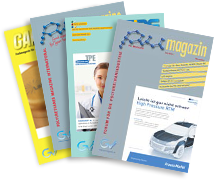 This paper illustrates the novel ­anti-scorch system Irgastab PUR 70, leading to extremely low emissions – VOC, FOG and aldehydes – to meet the most stringent emission specifications set by the automotive industry and regulatory bodies, to support the VIAQ targeted improvements. The Vertifoam Variable Pressure Foaming Machine (VPF-V) is now established in full commercial production. 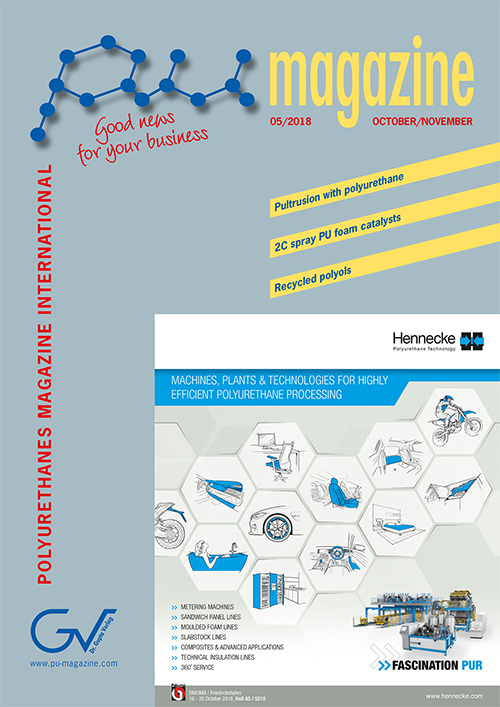 This paper gives insights into the operation of the VPF-V process and shows how the VPF-V equipment and process have been developed and refined to produce highly successful new foam that has opened up new profitable markets for the PU foam industry. The paper explains how a number of both formulation and equipment developments have given improved cell structure and block yields. It explains how a unique high pressure technology has been applied to the process giving multiple advantages, and how a brand new technique was employed to allow extended runs of highly reactive formulations without the problems normally associated with build-up. Formulation savings will be explained, as well as the efficiency of peeling large diameter, near perfect round blocks, to produce a new range of foams that can outperform polyester fibre in both cost and performance for bedding and furniture applications. Thermoplastic polyurethane (TPU), with its special position between elastomers and thermoplastics, also has great application potential in 3D printing. This applies in particular to Selective Laser Sintering (SLS), High Speed Sintering (HSS) and the Fused Filament Fabrication (FFF) process, which, like other additive manufacturing processes, are on the threshold of industrial mass production, above all of complex and individualized components.